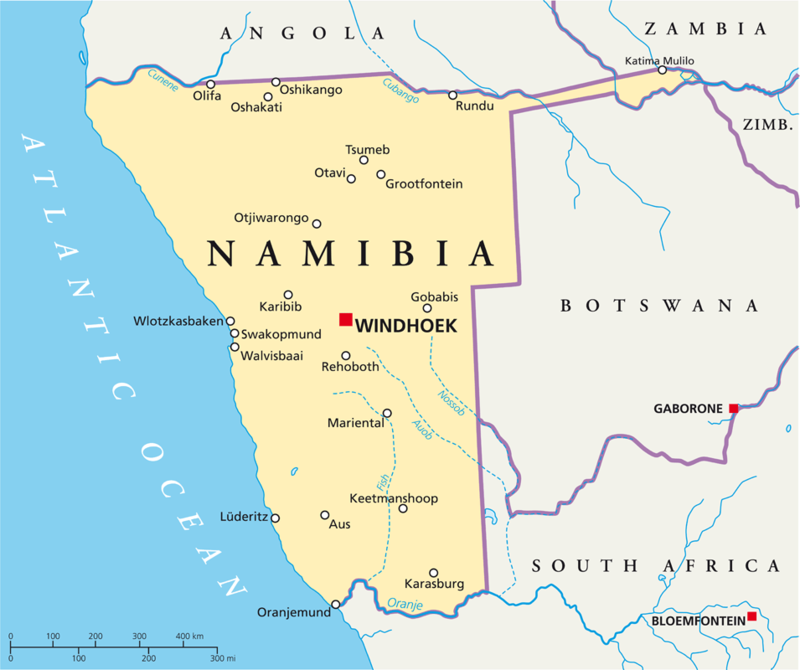 Desolate and beautiful, Namibia was one of the last African countries to become independent. Its two great heritages are the Namib Desert and Etosha National Park. The Namib Desert, one of the oldest in the world, arid since time immemorial, stretches along the thousand-mile length of the country in a wide belt. It is an ocean of quartz sand. Inland are oases and rocky valleys, the Namib rising to the mountainous central plateau that descends in the east to the Kalahari. For 30 miles inland the effect of the cold Benguela current creates a mist that condenses water on plants, such as the extraordinary Welwitschia, which lives for 2,000 or more. The dunes at Sossuvlei, coloured iron ore red-orange, rise over 1,00 ft. like giant waves, shifting north imperceptibly as the south wind prevails. They are a remarkable sight, especially at sunrise, and can be climbed. The Namib supports a wide variety of life from elephant to toktokkie beetle, that has adapted to its harsh extremes. From Swakopmund a tour can incorporate both Soussusvlei and the rock gorge of Sesriem Canyon. To the west the Skeleton Coast, so named from the skeletons of ships wrecked on the rocks by the treacherous currents, is whipped by the Atlantic wind. Time spent in this wilderness is rewarding – solitude, seal colonies, lions that live off them, the Roaring Dunes, the extraordinary geology of the desert, dwarf shrubs, underground rivers, and the knowledgeable guides that can explain it all. The Kuene River forms the border with Angola. The adventurous can raft 75 miles from Ruacana to Epupa Falls, returning through rugged Kaokoland, a pristine wilderness, where cattle-herding Himba search for pasture, largely undisturbed in their nomadic way of life. Damaraland’s attractions are the Petrified Forest, estimated to be 200 million years old, and some 2,000 rock paintings and engravings. Namibia is not just about safari, but the extraordinary scenery, adapted wildlife and people that manage to survive in its harsh environments.